The LN-229 human brain glioblastoma cell line was first obtained in 1979 from a female patient with right frontal parieto-occipital glioblastoma. The LN-229 cell line has a wild-type PTEN gene, mutated p53, and may potentially have homozygous deletions in the p16 as well as the p14ARF tumor suppressor genes. In a 1997 study, published in BBA Molecular Cell Research Journal, the LN-229 cell line was evaluated after the treatment with puromycin that killed LN-229 cells in a dose-dependent manner. In addition, stimulation of these cells with Fas ligand lead to apoptotic cell death within 16 hours. A 2011 Cancer Research study identified the LN-229 rodent xenograft model as a valid system to use the cryo-imaging technique for examining tumor progression and metastasis. This method differs from the traditional methods of serial sections and histological stains of brain tissue in that it uses computer algorithms to reconstruct 3-D images of this glioma model, essentially improving resolution and allowing the study of tumor cell invasion and dispersal. The LN-229 xenograft model has also been used in a 2013 study by Grommes et al. to identify the proliferator-activated receptor gamma (PRARγ) small molecule agonist pioglitazone as a potential therapeutic treatment for malignant gliomas. Pioglitazone was shown to cross the blood-brain barrier and exhibit antineoplastic effects in the LN-229 glioblastoma xenograft model. The 2012 study by Chen et al. also used the LN-229 cell line; this group identified a brain specific micro-RNA, miR-524-5p, that acts as a tumor suppressor. They demonstrated the targeting of Jagged-1 and Hes-1, key components of stem cell maintenance and angiogenesis pathways, by miR-524-5p and subsequent suppression of cell proliferation and invasion upon the miRNA’s restoration. 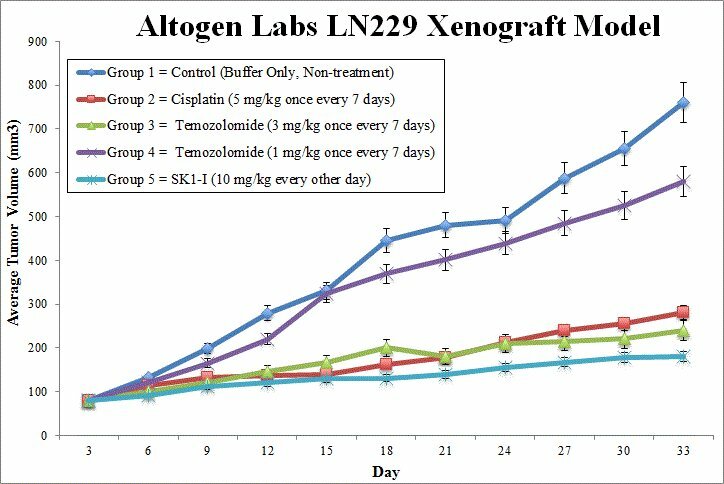 Altogen Labs provides full xenotransplantation services for LN-229 glioblastoma cells. The LN-229 cell line is used to create the CDX (Cell Line Derived Xenograft) LN-229 xenograft mouse model. Targeting S1P to induce apoptosis (e.g. SK1-I) and inhibit AKT signaling are some of the uses of the LN-229 xenograft model, including tumor growth suppression with chemotherapies (e.g. temozolomide or cisplatin). Exponentially growing cells are collected for inoculation with viability determined by trypan blue exclusion. A 98% minimum cell viability is required. Suspensions are adjusted so 100 µL of 50% Matrigel solution + LN-229 cell suspension contains one million cells. Cells are inoculated s.c. into a hind leg per mouse. The mice are athymic BALB/C or NOD/SCID and 10-12 weeks old. Calipers are utilized for tumor monitoring, with 100-150 mm3size tumors needed to initiate the study. Mice are sorted into cohorts and test compounds are administered following the schedule. Tumor measurements and mouse weights are recorded until tumor size limits are reached. Necropsies are performed for tumor removal, weights are logged and digital images captured. Choices for tissue collection include: submersion in RNAlater, snap freeze, isolate nucleic acids or prepare for histological analysis.